nj arts maven: Swing into Rutherfurd Hall for Great Jazz This Sunday! 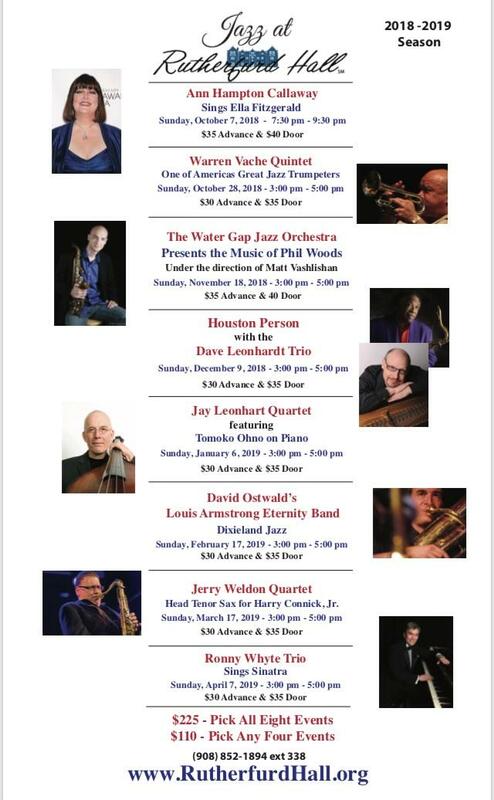 Swing into Rutherfurd Hall for Great Jazz This Sunday! Ann Hampton Callaway is one of the leading champions of the great American Songbook, having made her mark as a singer, pianist, composer, lyricist, arranger, actress, educator, TV host and producer. Voted recently by Broadwayworld.com as "Performer of the Year," Ann is a born entertainer. Her unique singing style blends jazz and traditional pop, making her a mainstay in concert halls, theaters and jazz clubs, as well as in the recording studio, on television, and in film. She is best known for Tony-nominated performance in the hit Broadway musical Swing! and for writing and singing the theme song to the hit TV series The Nanny. Don’t miss this outstanding pianist and vocalist in a solo performance. Buy Tickets for This Concert or Save and buy all 8 Concert Series or Pick 4 Events!